Real estate and construction business involves dealing with clients, working on large scale projects and so much more. Handling all this without the right technology can therefore prove to be more than handful job; especially if you are the manager. This is where something like ProofHub can make your life easy. In this post we are going to let you know about the things ProofHub can do to solve the challenges that managers and people involved in real estate and construction firms have to face. ProofHub is the complete project management software that real estate firms need. You can begin by creating a Project for every client, and adding team members and People who are involved in that particular project into ProofHub. Once the project is added, you can further go ahead with planning the projects in an effortless manner. Before beginning to work on a construction project, meticulous planning is a must. After all, a small glitch in planning can eventually lead to loss of not just property, but also risk lives as well. This is the reason that construction teams need to focus a lot on planning. As a project management tool for real estate teams, ProofHub solves the challenges these teams have to face in planning. For instance, you can create an Online discussion topic for planning phases of the project. Simply create a topic, add relevant people to it and begin the brainstorming session. Once the plan is finalized, it is time for implementing the plan. This involves assigning tasks to each team member and making sure that they are well-versed of what they are supposed. If you have been sticking to emails for the same, then it is time to look what ProofHub has to offer. With the easy to use task management software you can create Tasks (and divide them further in Sub-tasks as well). You can assign this task to team members. 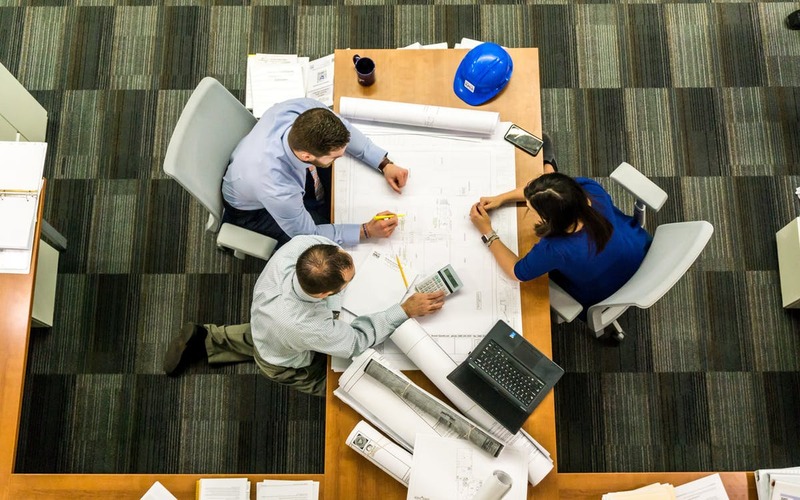 For instance, if it is a task to create the initial map for the construction project, you can simply assign the engineer who specializes in the same. Similarly, based on different areas of expertise you can assign different tasks. With the assigning task option, you also get features like labels to mark urgency of the task, option to add more than one person for a task, set a start and end date so that team members can work within deadlines, and plenty more. To simplify the management of complex tasks, ProofHub gives you the option to create Custom workflows. Using these workflows you can break down complex tasks into Stages, and for each stage you can assign people and do everything that you did during the task management phase. So, you can quite clearly see how ProofHub brings clarity in the work allocation process and streamline the way work flows in a real estate and construction firm. Creating the initial map for the real estate project requires collaboration between designers, engineers and managers. We all happily applaud for the final map that comes out, but no one knows how meticulous it is to complete the entire process. There is a lot of to and fro happening before the final map design comes out. To simplify this process of creating the map, Online proofing tool in ProofHub can come to the rescue. The initial draft can be uploaded as an image in ProofHub, and collaborators could be added to it who can review the file and share the feedback using markup tools and threaded comments. Once the changes have been worked upon, the architect can upload the latest file and the stakeholders and decision makers can simply approve it. For instance, if your team is assigned the project for a duplex and you need to work on the map for it, you can simply create a design and add it to ProofHub along with adding collaborators who can share their feedback and give approval to the design. As the name suggests, ProofHub is created to function as a hub where all your teams, work and communication comes together at one place. You can use Notes in ProofHub to jot all the information related to the construction project. And, store these notes in beautiful color-coded Notebooks to keep things organized. For example, during the construction project for the duplex you need to gather information like the material needed, client requirements related to designing of the entire construction and many more. You can create separate notebooks for material requirements, design requirements and always stay in ultimate control of the construction project. In the same way, you can bring together all the Files stored across third party apps like Google Drive, OneDrive, DropBox and Box in ProofHub. For example all the files like online brochures for real estate projects, marketing materials and more of these files could be stored in ProofHub's project management tool for construction teams. And, then how can we forget about Quickies - equivalent to those sticky notes that you use to jot down all your quick information. For instance, you can create a quicky for the client call in which he shared changes in the project details. Suppose you are working on a new construction project where you have to build a duplex building. Until the map is finalized the construction cannot begin. Similarly, unless the foundation is laid the workers cannot move ahead and go ahead with the next floor construction. All these tasks are dependent on each other. A delay in one means a delay in the entire project. With dependencies in Gantt chart you actually make team members more accountable as they know the fact that delay from their end would make the entire team and company suffer. So, planning becomes actionable thanks to Gantt charts in ProofHub. Apart from all these features, the one thing without which real estate and construction teams cannot survive is clear communication. And, this is exactly where Group chat in ProofHub comes to the rescue. Using Group chat you can communicate with team members, as well as clients without any trouble. You can even create a group of people who are working on the same task, and keep the communication flow clear and concise. Not to forget those beautiful emojis in ProofHub chat that add life to your office conversations. You can assign a dedicated Project manager in ProofHub who gets special privileges like real time updates, project progress reports and many more that can help him or her focus more on streamlining how things are going and take actionable steps to avoid any unwanted circumstances from arising in a project. And last, but not the least, feature that makes ProofHub a tool that real estate and construction teams cannot live without is Reports. It includes Resource reports, Time reports, and Project reports. For instance, you can use time reports to get a clear idea about which tasks consumed how much time. Similarly, Resource reports can work great to analyze individual performance, and Project reports paint a clear picture of how the entire project went. You can make ProofHub look like just you want to. There is the option to create a custom domain, add a profile picture as well as to set a theme and color of your choice to your account. In short, you can customize it to look and feel like your own. And, this adds a lot more fun to using ProofHub. ProofHub also has got a powerful mobile app that allows teams to stay in ultimate control of their construction and real estate projects no matter where they are. The app is available for both Android and iOS operating system. So, you can stay on top of everything even when you are on the go! If you are running a construction or real estate firm, and are tired of those endless battles to manage your teams and projects, it is time for you to give ProofHub a try. As you can see, it has got everything you need to stay on the right track and deliver projects successfully - every single time!